In 1998 due to the ageing nature of it's current fleet and changing business needs DB Schenker (at the time known as EWS) ordered 30 class 67 locomotives, primarily as replacements for Class 47s used on postal trains. The locos were built by in Spain by Alstom (under licence from General Motors) and delivered from 1999 to 2000. 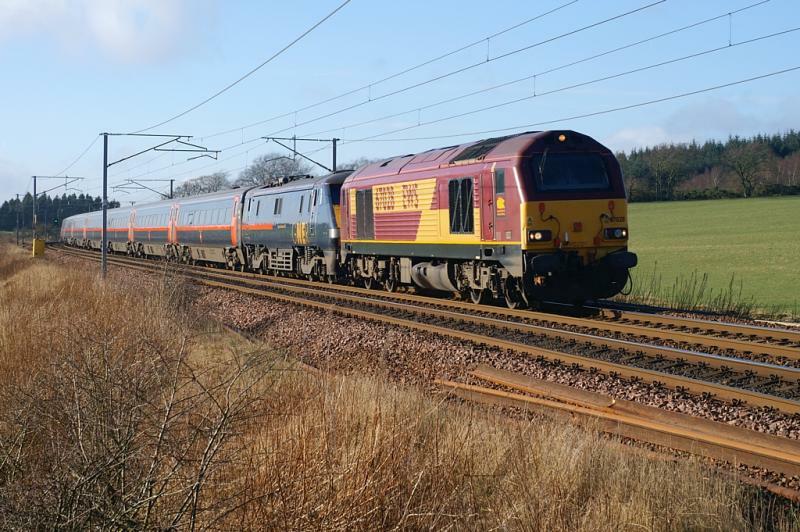 Although the locomotives are capable of running at 125mph, on the WCML they are permitted to run up to 110mph, between Edinburgh and Berwick maximum speed is 100mph and over other routes they are restricted to 80mph or lower. Due to their heavy axle loading there are also many specific speed restrictions at underbridges. Royal Mail terminated its rail contract with DB Schenker in March 2004 as a cost-cutting exercise and DB Schenker had to find new work for this fleet. Class 67s are widely referred to as 'Skips' by enthusiasts due to their uncanny resemblance to an upside down rubbish skip. In 2017, Colas Rail purchased 67023 and 67027. 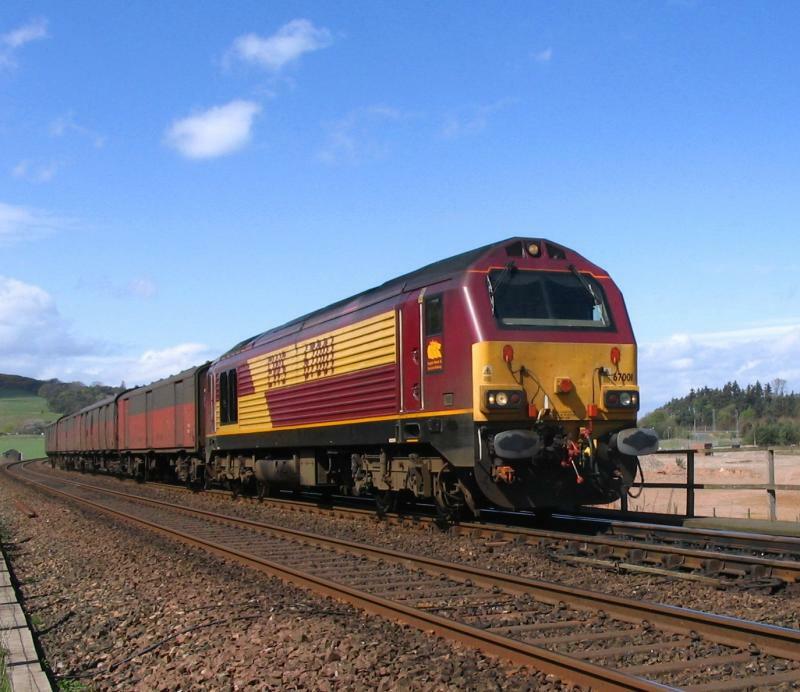 Class 67s are seldom used on freight services in Scotland. DB Schenker used to run a daily parcels service for DHL between Walsall and Mossend, then on to Aberdeen and Inverness which used Class 67s for traction. This ceased in February 2007 after DB Schenker lost the contract to road haulage. 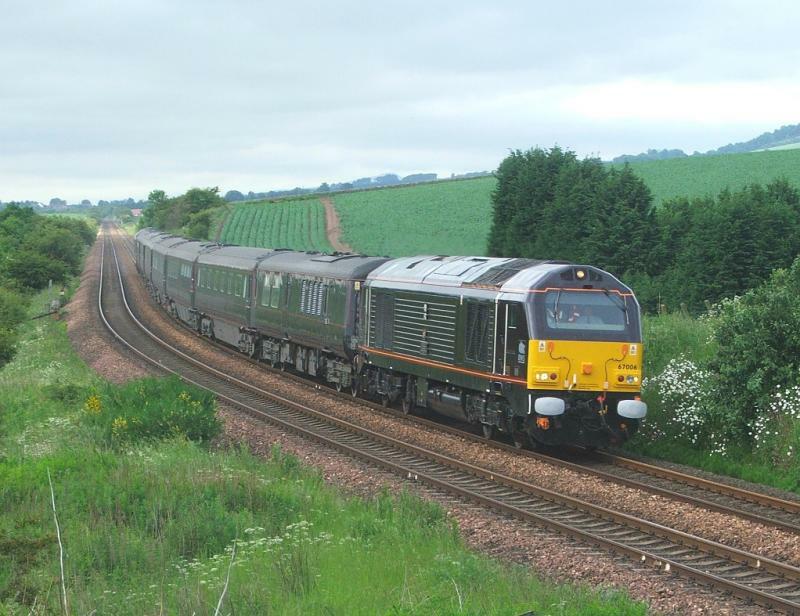 The class 67 which works the Aberdeen portion of the Caledonian Sleeper (see below) is often used during the day for local trip freights such as the china clay slurry tank traffic on the Waterloo branch. Class 67s are used to haul ScotRail's Caledonian Sleeper services north of Edinburgh Waverley. South of Edinburgh the three trains run as a single combined service to and from London Euston with a Class 90. 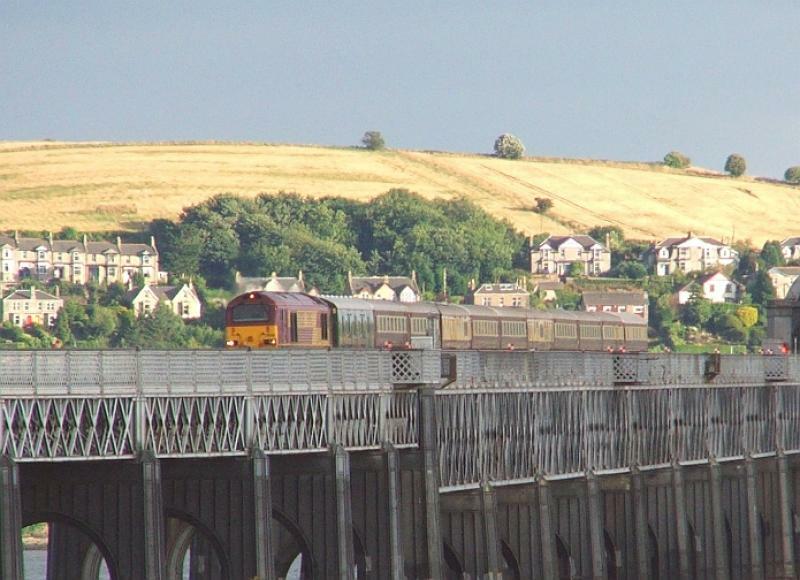 Class 67 locomotives were introduced on the Edinburgh - Fort William portion of Caledonian Sleeper in June 2006, replacing class 37s. To enable them to work on the West Highland Line a small pool of locos have had RETB equipment fitted. Since 2007 these locomotives have also been fitted with cast iron brake blocks and are restricted to 80mph. 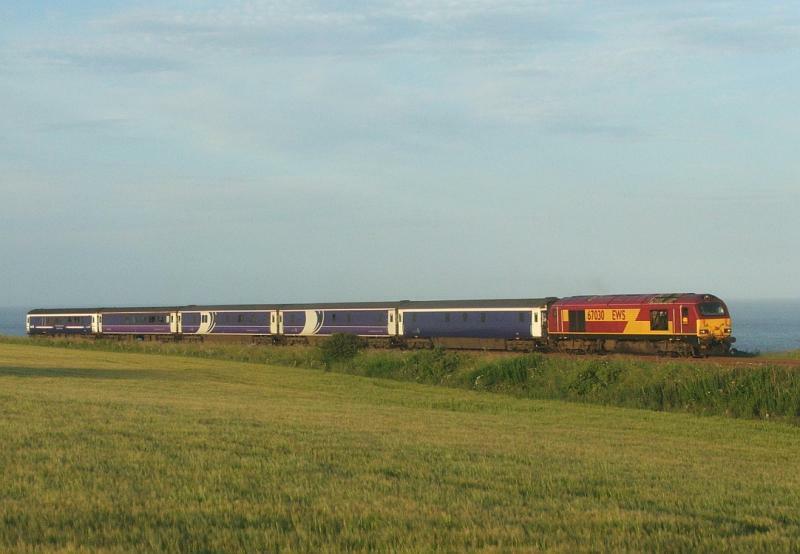 The current RETB fitted fleet (pool WABK) is 67004, 67007, 67009, 67011 and 67030. 67008 was also part of the pool until July 2006. Class 67s are also regularly used for the empty stock moves between Polmadie depot and Glasgow Central for the London to Glasgow lowland sleeper. ScotRail began running two peak-time loco-hauled services on the Fife Circle from 14th December 2008, the first a circuit in the morning and the second a circuit in the evening. In 2015, DRS class 68s are now used on the fife circle. In addition to the above, DB Schenker are contracted to provide four class 67s to East Coast as "Thunderbirds" for rescuing stricken IC225s or HSTs on the East Coast Mainline. One is stabled in Edinburgh Waverley or Craigentinny depot, with the others located at Newcastle, Doncaster and London Kings Cross. Because of their high top speed and Electric Train Heating (ETH) capability, class 67s are often used on charter trains. The EWS Executive Train is used by DBS's management team to travel to corporate events and entertain prospective and existing customers. It consists of 67029 " Royal Diamond " in Silver livery; three mk3 coaches painted in an attractive lined crimson livery, similar to that worn by Royal Train vehicles and a Mk 3 Driving Van Trailer which has been converted to allow it to work with the class 67. The executive train is an infrequent visitor to Scotland though 67029 itself has made many appearances both as a East Coast thunderbird and on the Caledonian Sleeper portions. The Royal Train was once powered by two dedicated class 47 locomotives, 47798 " Prince William " and 47799 " Prince Harry ". These were replaced in 2003 by two class 67s - 67005 " Queen's Messenger " and 67006 " Royal Sovereign ". The locos were quickly repainted in the same impressive Royal Claret livery as the 47s and also feature highly polished cast 'By Royal Appointment' crests, number and name plates. When not being used on this most prestigious train the locos are frequently used for more mundane freight and passenger work. 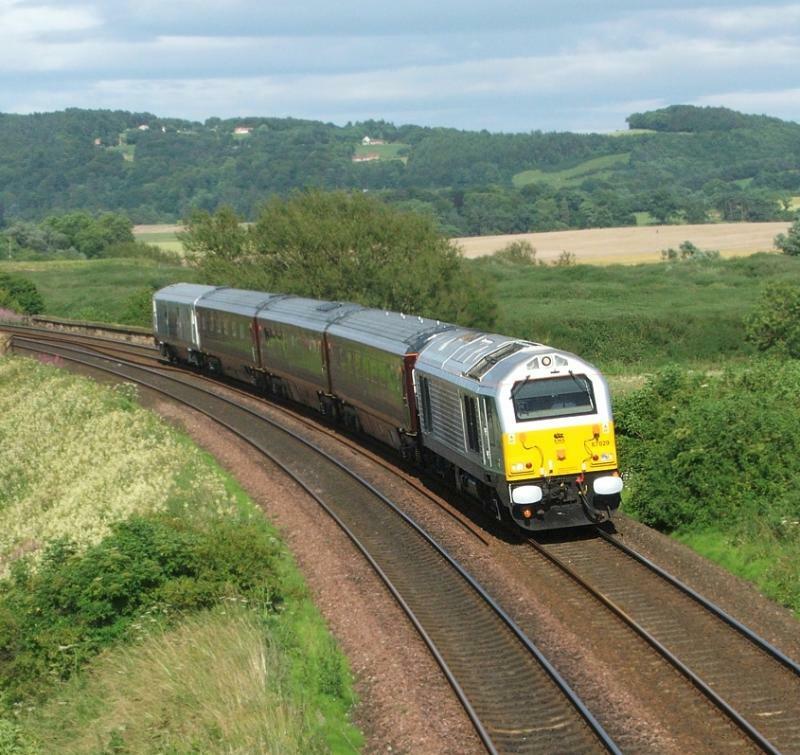 Both 67005 and 67006 have appeared on the Caledonian Sleeper in recent times. For obvious security reasons, information about Royal Train workings is strictly controlled by Network Rail and 'gen' such as times and routes is not publicised beforehand. Railway workers who give out such information can expect a visit from the British Transport Police. Because of this, posts on scot-rail.co.uk are often made as a result of a chance sighting and the train can prove to be difficult to photograph. Don't let that put you off though - the Royal Train is a frequent visitor to Scotland and there are many opportunities to view and photograph it all year round. Created by SC318250 and last modified by him at 23:43, 23 of June 2018.